In a recent press release, Archstone consulting reports on its findings in a recent survey on innovation. According to their survey, over 70% of the firms they talked to were planning to increase investment in innovation, yet over 50% were dissatisfied with the results of their innovation initiatives to date. Only 5% claimed to have "a highly effective innovation process". Clearly there's a significant disconnect between these figures, and we believe one of the important reasons is that innovation is still so poorly defined from a process and systems perspective. As many of you know, we at OVO have been working to define an "end to end" process that supports innovation, and to define the tools and software necessary to support that process. Much like a purchasing process has defined phases or steps, and enabling software, or as a sales team has defined phases or steps and underlying CRM software, we believe innovation needs to be defined from a process point of view to be repeatable, and will need integrated software applications as the number of people and number of ideas increase. 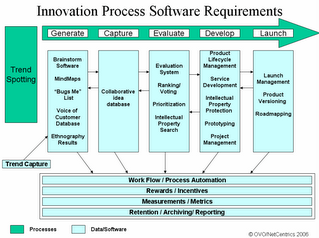 To that end, we've put together the following diagram to start a discussion about innovation processes and tools. At the top, in green, are activities in the innovation process, starting with identifying trends and customer requirements. In the arrow are the steps we advocate for an innovation process: generate ideas, capture ideas, evaluate ideas, develop as products or services and launch the new products or service. In blue are the data and system requirements to support each phase of the innovation. These are divided into two sections: software or data that support a specific step in the process (eg brainstorming software supporting the "Generate" step) and software or data that supports the entire process, which is represented at the bottom of the graphic. These applications or data requirements span the length of the process and include requirements like capturing metrics across the process and reporting across the process. By creating this framework, we are trying to forecast what we think will happen to innovation, and use analogies from the ERP world and CRM world. Increasingly, firms value consistent, collaborative information that enables a business process. This means that the existing software applications that support "innovation" will have to consolidate and support the entire process in one component framework or integrated solution, just like the way ERP consolidated from financial software, purchasing software and inventory software. Innovation is an important and necessary business process, and probably the least well supported from the standpoint of process and software today. This framework is one we've put forward as a representation of the processes and tools necessary for repeatable, successful innovation. If you care to, please comment or provide your feedback. I think if we practitioners, consultants and interested bystanders can create a consistent vision for the future of innovation and the tools and processes necessary for success, we can help our clients and business partners become more successful. Let me know your thoughts and what you would change in the framework. Thanks for sharing your framework - it looks robust to me - and stimulated a couple of thoughts. One aspect that might be worth exploring is how this interacts and integrates with existing processes, data and systems. For example how does it link to competitive intelligence capabilities, the CRM environment, knowledge management systems or reporting/performance measurement systems. Often the opportunities for innovation are under our nose we're just not tuned to spot them - but if we can integrate innovation tools into the business as usual environment we may succeed in making innovation a business as usual activity rather than an afterthought. There is a need really building to build a more structured innovation preocess to help the company and the individual. Today we don't have any integrated application but there are emerging a number of techniques, software and tools that might be able to be combined into a ERP for innovation. You add to that emerging process. I take dispute with some of your sequence. I strongly believe Roadmapping must go at the front end, not at launching- although this depends on your definition if end-to-end. I'd say that a map that I relate too was recently produced by Pretium that places platform technology and Business options as the first activity, followed by Roadmapping to exploit this along with Idea Management, then the Stage Gate process and having a systematic value system in place to get to commercialisation. Within your suggested map you introduce the aspects before Ideas of spotting, trend capture, VOC. I feel your Develop is more Commercialise and we need to asdd in other tools, evaluations like a clear Go-to-market process, the Diffusion of Innovation and their options, Web-based technology. Thanks for describing this framework. I can see how it can implemented using some open source portal frameworks and portlets (like Plone, Liferay) or commercial products. If you have pointers on how tools can be used for trend spotting, I would appreciate hearing about it. Right now, we use our product InfoMinder to track certain web pages. But this is a low level tracking of information. Spotting trends may require a higher level Tech Mining or Text Mining. I like your concept of Gernate, Capture, Evaluate, Develop, and Launch. I also know that in many industries there is a serious problem of developing prototypes way to late in the process. I would rather see some fast-cheap prototypes available BEFORE the evaluation. If you put a step called "Concept" in between Caputre and Evaluate you might have a better framework to do the evaluation. The prototypes and concepts in that new step should also have a smell test applied by real customers ... not just the internal experts who may be out of touch. FYI - your cool diagram does not show up in Mozilla Firefox 2.0. Just thought you might like to know (so non-Internet Explorer users can benefit, too). Thanks for this submit, I have been all the time looking for this convenient articels in every single place however could not discover full information supplied here. thank you. and I'll just reference a few of you words . Hiya!, Very attention-grabbing angle, we were speaking about the same thing at work and found your site very stimulating. So just needed to com-ment a huge thanks for all your effort. Please keep up the good work your doing! Thanks quite a bit for show rather useful informations. Your web page is great.I'm impressed by the info that you've got on this blog. It shows how very well you understand this subject. Bookmarked this process web web page, will arrive again once more for lots more. You, my buddy, amazing! I found just the info I previously seemed for in all places and just couldn't come across. What a excellent web site. Similar to this internet site your site is one of my new favorite.I similar to this info shown and it has given me some type of motivation to have accomplishment for some trigger, so keep up the useful work! As on the lookout for fairly some time for finding a useful articles or blog posts on the subject of this distinctive problem . Researching in Google I lastly came upon this blog post. Reading this So i'm pleased to say that I’ve received an awesome impression I got here across whatever I wanted. I most actually will make sure to remember this blog and look constantly. Time is cash as the old saying goes, and by reading this publish, I noticed that I saved myself numerous precious time, which would have been otherwise spent on studying low consistency information all around the almighty web. Thanks for the straight to the purpose, helpful enter! We're a gaggle of volunteers and beginning a new initiative in a community. Your blog supplied us helpful information to work on. You may have achieved a marvellous job! Very great articles. I’ve discovered your web site by Aol and I’m actually completely satisfied in regards to the info you might have inside your post. By the way in which your blogs design is quite broken with the Chrome net browser. Could be really great if you happen to’re can fix that. Anyway maintain within the great function! What an ridiculous assortment of effectively performed articles, it seems like now-a-days everyone seems to be simply copy/pasting and stealing content material all the time, however I guess there's nonetheless hope in sincere blogging. Time is cash because the old saying goes, and by reading this submit, I noticed that I saved myself lots of precious time, which would have been otherwise spent on studying low consistency info all around the almighty web. Thanks for the straight to the purpose, helpful enter! Thanks for another incredible blog. Where else might anybody get that form of info written in such an ideal approach? I've a presentation that I'm just now working on, and I've been on the look out for such information. I'm not an skilled about this matter, however as soon as learning your weblog publish, my understanding has improved extensively. Please allow me to getting your rss feed to be in contact with any future updates. Good work and will cross by means of to my buddies as well as my site audience. Greetings everyone, This webpage is superb and so is how the matter was expanded. I like some of the feedback as properly though I would like all of us hold it on matter so as add worth to the subject. It will likely be additionally encouraging to the author if we all may share it (for some of us who use bookmarking companies corresponding to a digg, twitter,..). his day I've been searching for information on various issues, this I found very good and I would like to congratulate you for your work. Progress is a nice word. But change is its motivator. And change has its enemy. very nice to read this post..